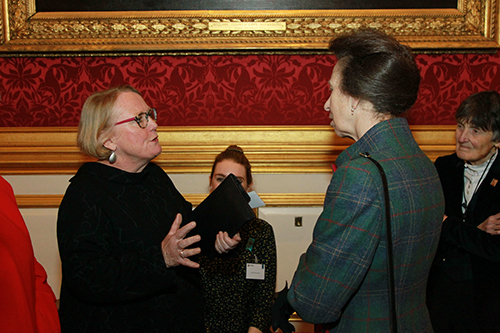 Hosted by the Chancellor of the University of London, Her Royal Highness The Princess Royal, Leading Women from across the world were invited to gather at St James’s Palace to continue conversations about issues of equality. City, University of London is a self-governing member of the University of London (UoL) federation. In 1868, nine women were admitted to the University of London – the first time in the UK that women had gained access to university education. 150 years later, the University of London has marked this anniversary with its Leading Women campaign. Celebrating the stories of 150 remarkable women associated with the University through blog posts, podcasts and pop-up theatre, staging events from panel discussions to art competitions, and founding 150 new scholarships for the next generation of women students, the activities have continued to promote and reinforce the role of women in global higher education into 2019. As the year-long celebration draws to a close, Leading Women from across the world were invited to gather on 29th January at St James’s Palace, London to continue conversations about issues of equality, and which was hosted by the Chancellor of the University, Her Royal Highness The Princess Royal. Professor Julienne Meyer leads Research and Development in Care for Older People at City, University of London and was one of the Leading Women invited to the gathering. Words can’t express how lovely it was to be acknowledged in this way. Having been an MSc student, PhD student and lecturer at the University of London, at King’s College London, and more recently a Professor at City, University of London, the University holds special meaning for me both personally and professionally. “It was incredible to visit St James's Palace, residence of kings and queens of England for over 300 years and have the opportunity to meet Princess Anne. However, the best part was connecting with the other “remarkable” women who, like me, were puzzled as to how and why they had been selected. To find out more about the Leading Women campaign, visit the University of London website.